Hartley Glass Domestic - Pet Doors. Hartley Glass supply and install Pet Doors to allow your pet easy access to the comforts of home or the freedom of outdoors. 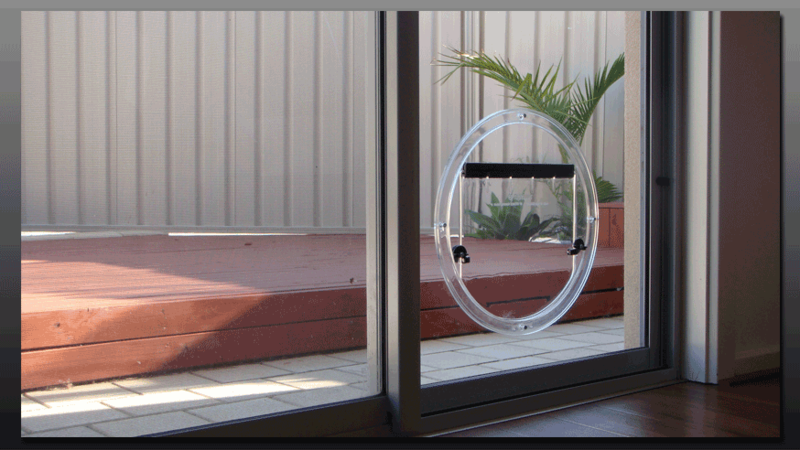 Our pet doors are specially designed to be installed into glass. Whether it be a sliding glass door, hinged glass door, laundry or kitchen window or any other low level glass panel around the home, we can perfectly integrate a pet door that provides full convenience without compromising on the look and feel of your home. Other pet door systems don’t provide the perfect finish that ours does. In fact, other pet doors ensure you have to compromise on the look and often the security of your home. Our pet doors are comprised of high grade commercial acrylic and double sided mounting system which makes these pet doors strong, durable and blend in with the surrounding architecture of your home. All of our pet doors are installed into A-Grade toughened safety glass (In full compliance with Australian Standards), and the finished glass panel, complete with your new pet door, is then delivered to your home and professionally fitted by our fully qualified glaziers. This ensures you get a perfect and professional finish to your pet door that compliments your home.......Guaranteed! Safety & security are paramount to any discerning pet & home owner. Our pet door system provides safety for your pet by allowing them to freely travel between inside & out with the flexibility to easily lock the door or have it only swing one way to suit your needs at any given time. 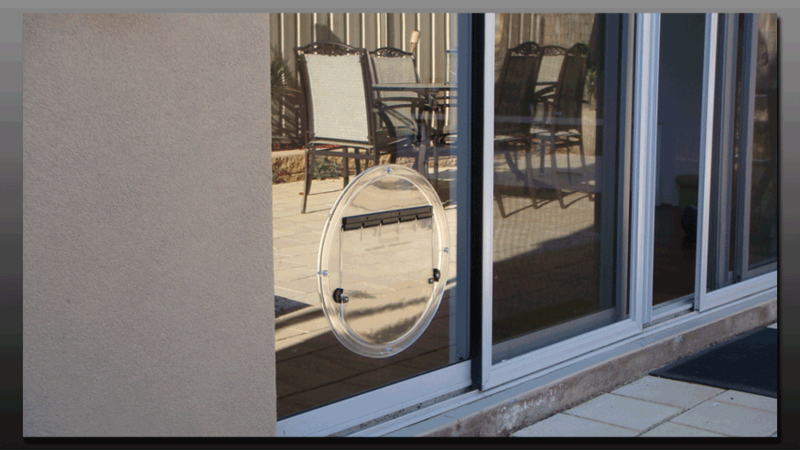 As the pet doors are installed into A-Grade toughened safety glass in full compliance with Australian standards, your Pet Door does not compromise the integrity of your glass. The pet door cut out is pre-cut through the glass prior to being toughened so you get an end result that can withstand the weather and your pet! 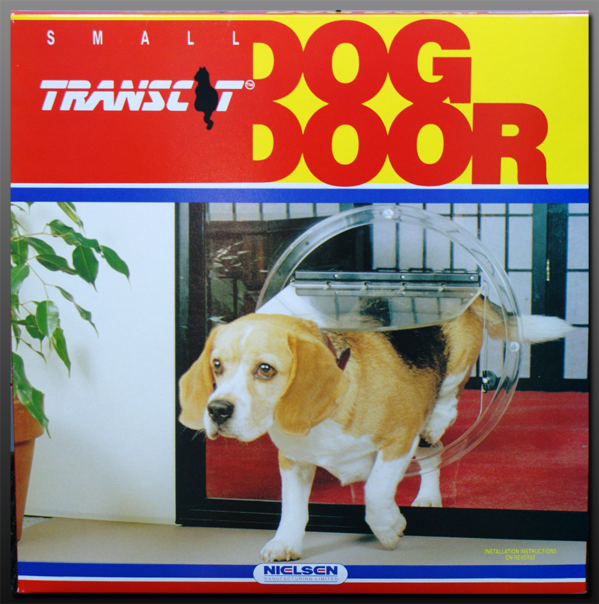 Unlike other pet door systems, this is a fully integrated solution. This means that the security of your home is not compromised. 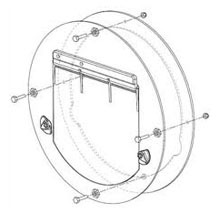 Other pet door systems operate like an "insert panel" which is easily used by thieves to gain entry to your home. Additionally, for personal safety & security, all of our glaziers have police clearances, OH&S qualifications and are fully trained industry professionals. This means that you have the peace of mind that someone you are letting into your home has the skills and integrity you should demand. 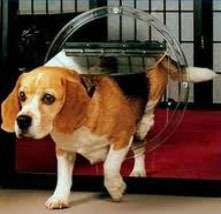 The Pet Door system can be easily upgraded to become electronic. This unique system allows only YOUR pet to enter through the door, keeping out any undesirables. 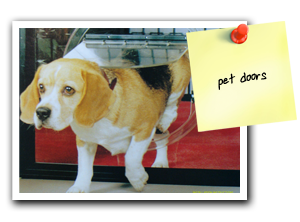 This system simply attaches itself to the underside of the pet door and senses when your pet is approaching via a collar tag worn by the pet. 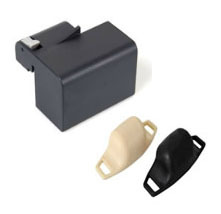 This is an optional extra that is available to you to further enhance your pet & home security. No more having to race home from work to let the dog out! No more being woken up at 3am because poochie needs to go to the bathroom! The Pet Door system provides your pet with the ability to get in and out whenever they want and give YOU the freedom to come and go as you please without having to rush home to check on them. One of our many happy customers says "Her pet door has transformed her life! Her cat can get to the safety of the home at any time and there are no more messes to clean up! Best of all she gets a good night's sleep without the cat jumping on her demanding to be let out in the middle of the night"
Our pet doors are available in two sizes. 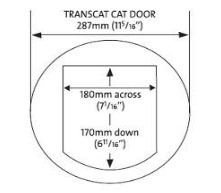 The smaller door is suited to cats and small dogs, while the larger is suitable for small to medium sized dogs. Your new pet door can be installed within 7 business days from the placement of your order! We will send one of our qualified, police checked glaziers to measure the window or door and identify with you the optimal placement of your pet door. Once these measurements are taken and you place your order you can expect to see your new pet door in action within 7 business days! 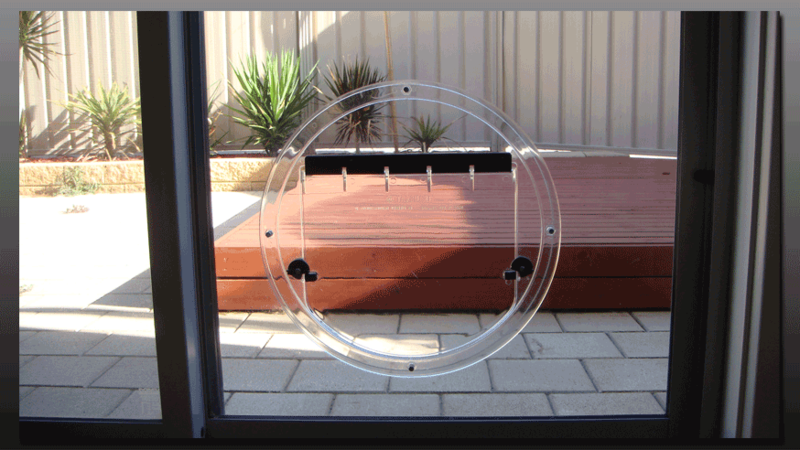 During this time, we cut your new glass panel, drill the mounting holes and cut the opening for the pet door. The glass panel is then placed through a toughening treatment to ensure it is strong and durable to support your pet door. 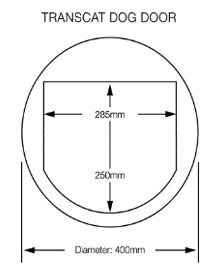 This process is in full compliance with Australian glazing standards. Once this is complete, we arrive back at your home and install the new glass panel complete with your fully integrated pet door. We then clean up and take away the old glass panel....no fuss, no bother......all within 7 days! Your Pet Door is guaranteed for 5 years from manufacturing defects. Your Glass Panel is guaranteed for 5 years from manufacturing defects. The Installation & Workmanship of our fully qualified glaziers is guaranteed for 5 years. 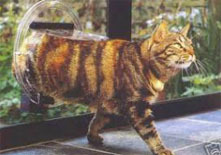 This means you can get your new Pet Door fully installed from as little as 10% upfront and easy fortnightly payments. Approval in as little as 5 minutes. Talk to our team today about Certegy's NO INTEREST EVER payment plan. We will take care of the application for you so you can get your glass Pet Door installed as quickly & conveniently as possible!